Black Holes in the Library!!! The large image shows the jet streaming from the center of the galaxy M87, in visible light. 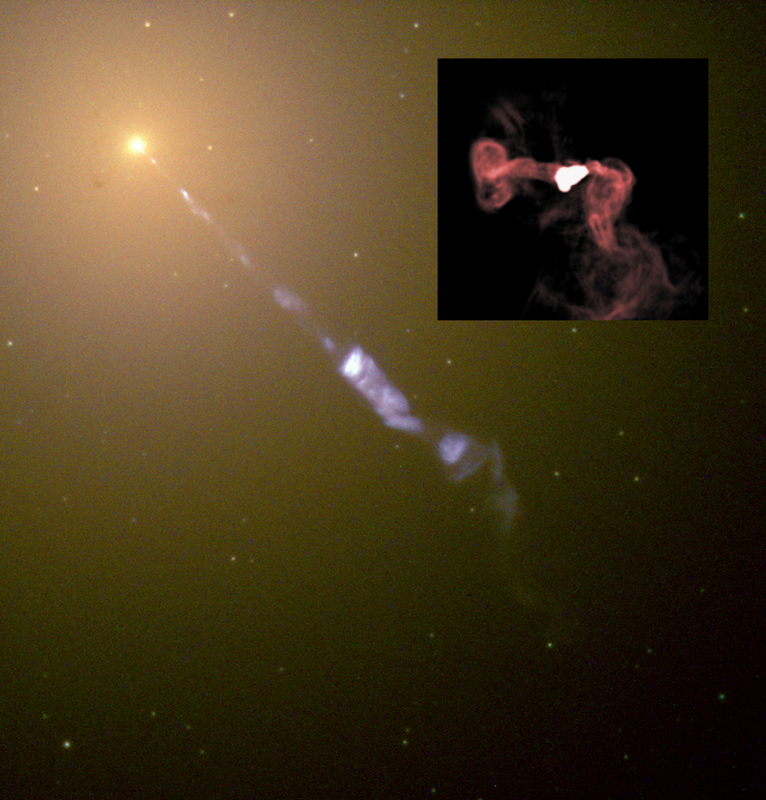 The inset zooms in on the location black hole, and shows the swirling gas around the galaxy’s core in radio light. M87 is one of the largest galaxies known, and has the largest-known black hole, estimated around 6.6 billion times the mass of the Sun. At the center of the Milky Way lies a strange object. Four million times the mass of our Sun, yet occupying a volume much smaller than the Solar System, this object is a supermassive black hole, one like many others that reside at the hearts of galaxies throughout the Universe. Despite the difficulty in studying black holes and the fact that they don’t correspond to anything in our daily lives, we know a lot about them through decades of observation. At the Richmond (Virginia) Public Library this Saturday, I will go over some of the best evidence we have for the existence and nature of black holes: what they are, how we can see them even though they emit no light of their own, and what they tell us about our galaxy and the Universe we inhabit. The talk is for all ages, though I think older children will appreciate the subject matter more. (There is also a Facebook event page, though it’s fairly sparsely populated at the moment.) I assume no prior knowledge of the material, and bring your questions! I intend to speak for about 20 minutes, then open things up for discussion. The talk will begin at 2 PM. Here’s the complete spoiler version of the talk I gave at Science Pub RVA a few months ago. A recent observation was able to peer closer than ever before to the black hole at the center of the galaxy M87, revealing details about the matter swirling around it. In the Milky Way, the star with the closest approach to the central black hole may tell us a lot as we study it over the next decades.